Until February 2017, I had never photographed any motorsport. I run an audio production company with 60 staff but over the past 5 years, I’ve devoted much of my spare time to photography. In 2015, after spending 26 weeks in Africa over 3 years, I released a large format photo book; Africa on Safari. It was published in the UK and shortly after, National Geographic picked up the German language rights. I only decided to pursue F1 photography after attending the 2016 Abu Dhabi Grand Prix as a Red Bull Racing Paddock Club guest. Standing in the Red Bull garage, listening via headphones to Daniel Ricciardo calmly talking to his race engineer before heading out on track got me excited and it was at that moment I decided I’d like to be a part of this colorful sport. After a little bit of digging, I found the right FIA person and put forward a proposal that caught his eye. At first, I was accredited for testing in Barcelona. Then, the first race of the season in Melbourne and then it was a matter of applying for accreditation race by race. 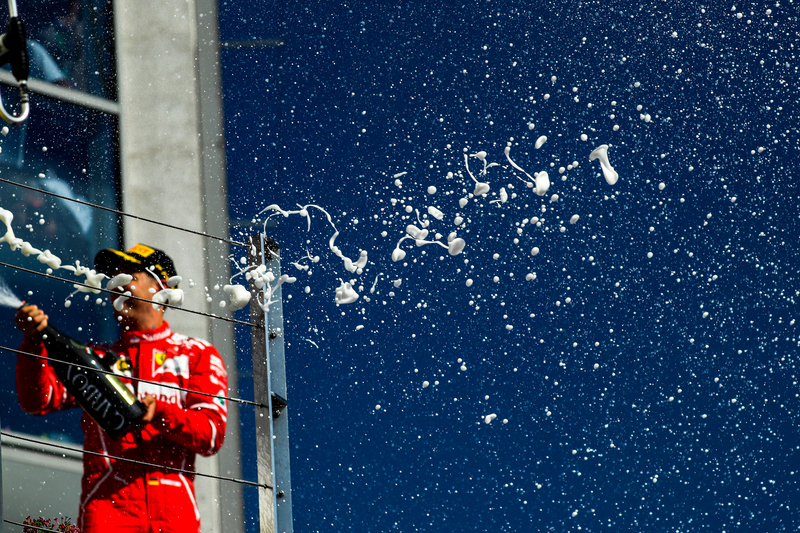 Champagne bubbles at the podium celebrations at Formula One World Championship, 2017 Hungarian Grand Prix. I was in the fortunate situation of being able to fund the year myself. My initial plan was to shoot most races, post a daily blog and perhaps find a couple of clients who would pay for images. On the first day of the 3rd race in Bahrain, I was in the right place at the right time resulting in me securing a deal with one of the largest motorsport agencies, Suttons. They’ve been around for decades and have a number of high profile clients (including F1.com) and suddenly my images were being seen by millions. I’ll be honest, the shots from testing and the 2017 Melbourne event were ordinary, with the exception of this shot. 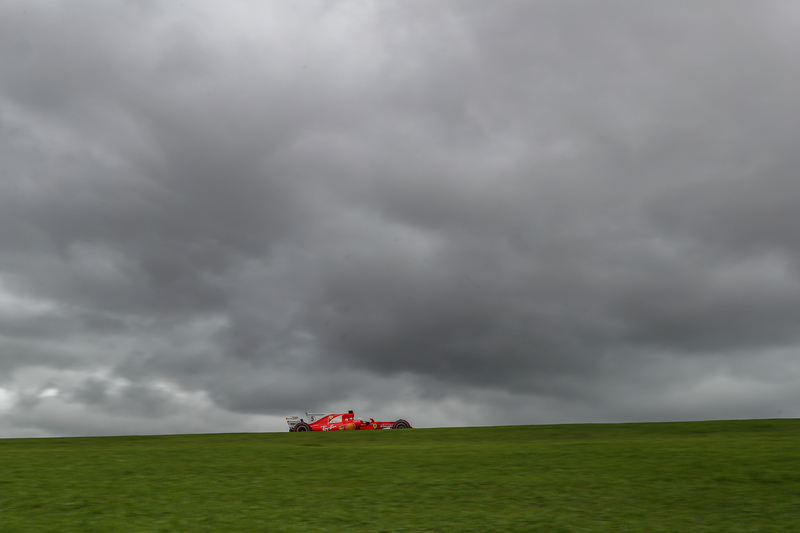 It would turn out to be one of my year’s best and it was taken on my 6th day as an F1 photographer. A Melbourne photographer was kind enough to tell me about this shot. “Only the Red Bull and Force India’s spark at turn 6 and they only do it for the first couple of laps when they are heavy with fuel,” he explained. I headed out there for the Saturday morning practice session and was surprised to see there was no photography hole cut through the wire. It was only then that I realized that using a 500mm lens at f4 rendered the wire invisible. 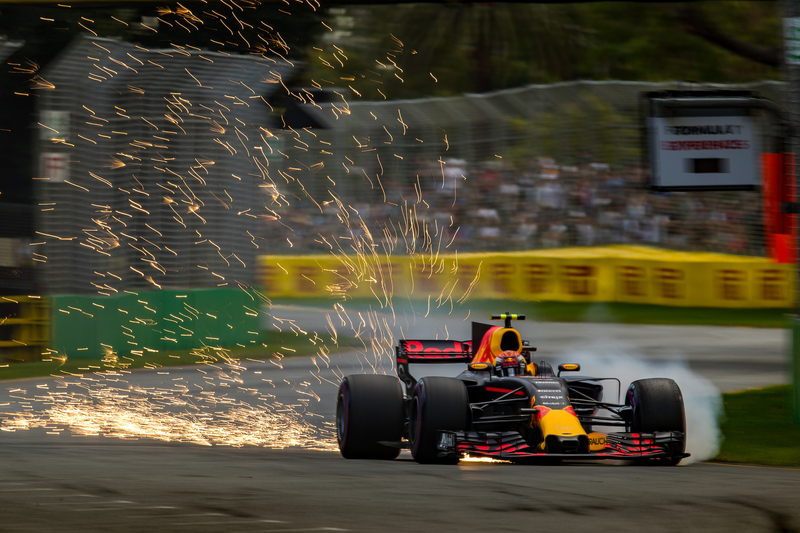 My Melbourne colleague had already suggested I shoot at 1/60th of a second so the sparks had some length to them and when Max Verstappen came through the first time, I shuttered away on my Canon 1DX Mk2. Max Verstappen at turn 6, 2017 Australian Grand Prix. I shot about 20 frames of which 2 were sharp and this one, was the winner. I showed it to Max in the paddock at the 2017 Shanghai GP and his assistant contacted me that afternoon saying Max “would love a copy of it for his Monaco apartment”. I delivered it to him next race and had him sign a copy for me. My learning curve was steep over the year. Initially, I failed to grasp the importance of backgrounds. By season’s end, I realized that the background was one of the major differentiators between an average shot and a great shot. Portable toilets and cranes are to be avoided, as too are empty grandstands. Often moving just a few meters left or right enabled me to avoid ugly background distractions which enhanced my shots. While the cars are on track Friday – Sunday (except for Monaco when they replace Friday for Thursday), an F1 photographer’s week starts a day earlier. On Thursday (Wednesday in Monaco) the Paddock comes alive with various media interviews, FIA drivers’ press conferences, sometimes a fan day or a 3-day ticket holders’ pit walk along with plenty of set-up work in the pits. It’s also an opportunity to shoot the 8 – 12 drivers who walk the track. 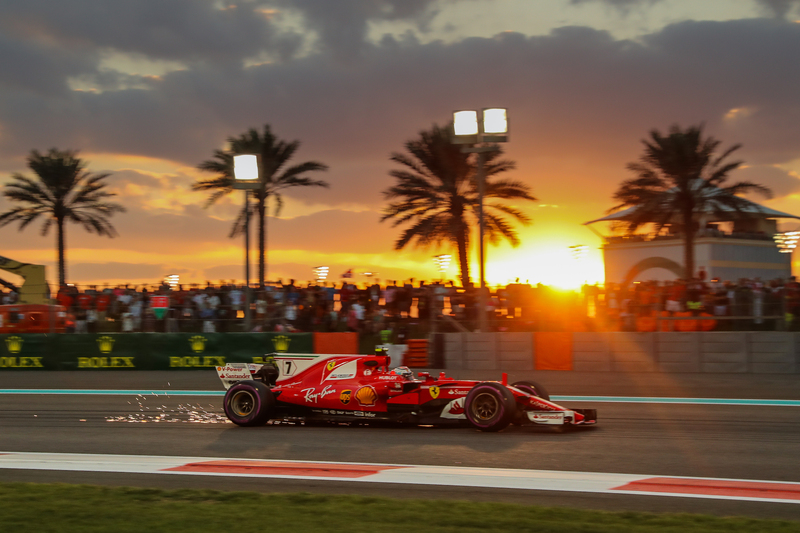 Kimi Raikkonen sparking at turn 3 at Formula One World Championship, 2017 Abu Dhabi Grand Prix. One of the most crucial shots at any race is the start shot. You only get one chance at it and it must be sharp. I typically shoot at 1/1200th or faster at f/8 so all of the cars are sharp and in focus. Sometimes I set up a second camera shooting wide and fire it using a remote control linked to my main camera, doubling the number of shots on offer to me. News outlets need images within minutes of them being shot, particularly the first lap shot. This requires me to select the best 2 or 3 images after the field has passed and send them to a Huawei internet dongle in my pocket, via a Canon WFT unit mounted to the side of my camera. The pictures are sent directly to my Perth office where a couple of minor tweaks are performed before they are uploaded to www.kymillman.com/f1 and then sent to news outlets that I shoot for. Minutes after hitting send on the camera, people around the world can see what I saw through the viewfinder. The non-urgent shots are sent from the media center at regular intervals throughout the day. This means downloading pics to my laptop, selecting the good ones using Photo Mechanic (an absolute must-have program), processing them quickly in Lightroom and then uploading them to my website. Sebastian Vettal at Formula 1 World Championship, 2017 Brazilian Grand Prix. As 2017 progressed my workflow improved allowing me to select, process and send hundreds of photos in 60-minute windows throughout the day. Over a typical race weekend, I will shoot around 15,000 images and use around 1,000. I shoot in RAW on the first card and in JPG on the second in each of my 2 cameras. Given the time and money spent getting these shots, it is vital to protect and back them up. Shooting on two cards in the camera is the first safeguard. I then copy the RAWs to my laptop for editing at the first opportunity. I keep the CF card with the JPGs on it in my camera the whole weekend and back that up to my external hard drive after each race weekend. I put the JPG card in a different bag to the RAW card in case I lose one bag in my travels. 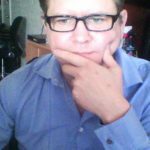 Once back in my Perth office, I copy my laptop and the JPG cards to the office NAS and as a final safeguard, that is backed up to the cloud for offsite recovery. Back at the track, shutter speed is a crucial consideration. If cars are coming straight at you there’s no problem shooting at 1/1,000th of a second or faster, however, when shooting side on, I drop the shutter to around 1/320th or slower so that there is some blurring of the logos on the tyre wall and background. This shows that the car is moving. At times I go as low as an eighth of a second but no matter what shutter speed I select, I almost always pan with the car. The lower the shutter speed, the more precise my panning must be to keep the car sharp. Estaban Ocon, Pit straight, Friday at 2017 Chinese Grand Prix. 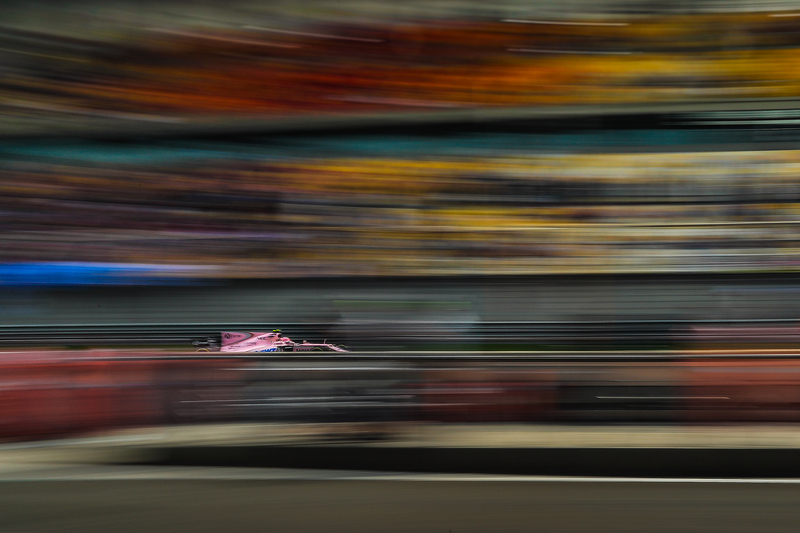 This shot taken in China was shot at 1/20th of a second with the car visible just above the pit lane wall. As a slow speed panning novice, I have a success ratio of around one in a 40 shots; the longtime pros are probably getting sharp pics every 10 shots. Working for circuits and news outlets, it’s important to shoot images which show where you are. In Baku, there’s an iconic castle that makes a super background. In Monaco, wide shots showing the boats in the harbor clearly indicate the location, while in Japan, incorporating Suzuka’s iconic ferris wheel shows where we are. I also look for opportunities to shoot low so you can see under the cars’ body. This is possible on crests like this shot from Malaysia. But normally this is difficult as there are few photo holes low down on a fence. I discovered mid-season that shooting through the gap in the Armco not only allowed me to shoot low, it provided a different look. 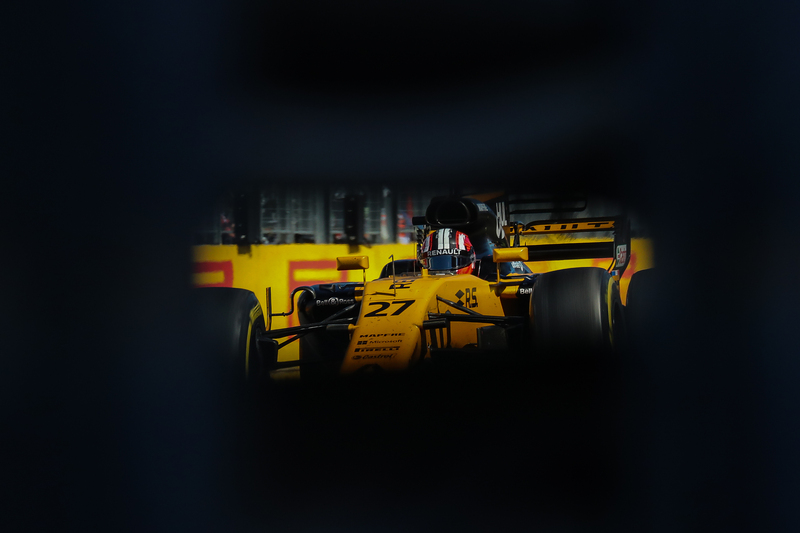 Nico Hulkenberg through the armco fence at the 2017 Hungarian Grand Prix. Kit-wise, I carry 2 Canon 1DXMk2 bodies and the following lenses: 600mm, 100-400mm, 70-200mm, 135mm, 50mm, 24-70mm, 16-35mm and an 11-24mm. If I know I am going to be shooting from an elevated position I will take a 45mm tilt shift lens too. I sign a waiver acknowledging this fact and nowhere was I more aware of the danger than at the bottom of Eau Rouge in Belgium. Here I shot on the inside of the corner, above the Armco fence with no wire to obstruct my shot. 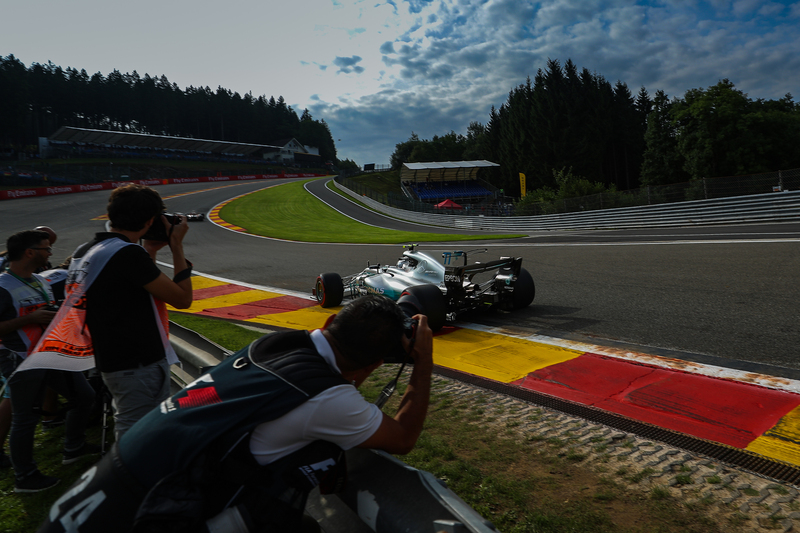 2017 Belgian Grand Prix, Practice, Spa Francorchamps, Belgium. During the race, groups of 4 or 5 cars would scream past at 300km/hr. A stone flicked up by one such car would be as lethal as a bullet. But it was the noise of the tyres over the kerbing that struck me; it was louder than the engine noise. I felt much safer when I shot low through the gap in the Armco. You still feel the wind pushing through the gaps and hear the tyre noise but not seeing them coming towards you negates some of the fear. The most dangerous place for photography is probably the pits. During practice sessions, the cars are constantly entering and leaving their garages. On a couple of occasions, a team crew member has pulled me back by my shirt as a car was nearing the pit box. Thankfully each team assigns one or two crew members to ensure our safety. While we’re typically at the track for 12 hours each day, the cars are on track for just a small portion of the day. For the hours when they’re not on track I wander the paddock. The media requires new driver shots every day so photographing the drivers arriving and moving around the paddock is a big part of the brief. The best driver to shoot for me is Daniel Ricciardo; the hardest, Lewis Hamilton. Daniel is almost always smiling and given we’re both from Perth I have got to know him over my short time in the sport which means he often gives me a smile as he passes by. 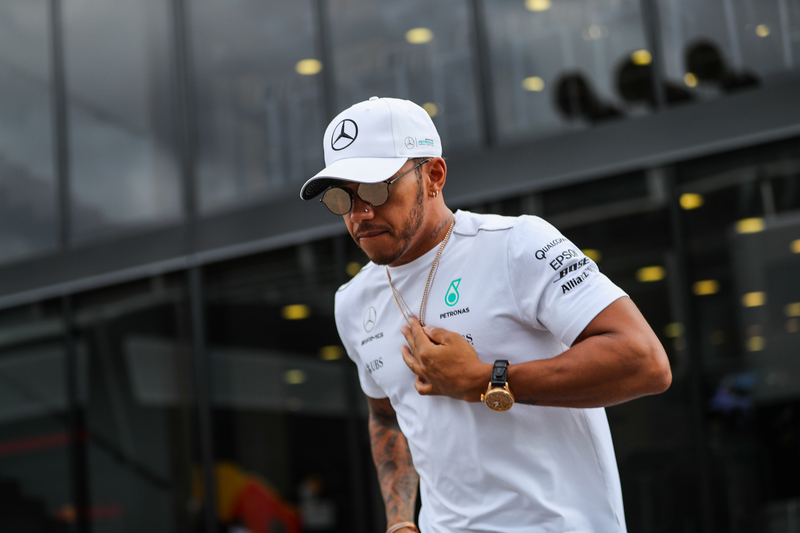 Getting low to shoot Lewis Hamilton after he’s posed for a fan selfie at Formula One World Championship, 2017 Italian Grand Prix. Lewis, on the other hand, often walks with his head down looking at his phone meaning you have to get low to see his face. I wait until a fan snares him for an autograph or selfie and then position myself low, in front of him, knowing that when he moves away from the fan I’ll have a second or two where he won’t be distracted by his phone. On racedays, I rarely see any of the on-track action for the last ten laps. During this time I am in a queue under the grandstand waiting to enter the pits for the parc ferme shot. After the winner passes the finish line, the gates are swung open and a hundred or more photographers and video cameramen/women sprint down pit lane. The top 3 drivers park, get out of their vehicle and head towards their crew. It is here that I snap some of my best pics. Being close to the action, and sometimes right in the middle of it, means selecting a wide angle lens (16-35mm or 11-24mm). This is no place for the faint hearted especially when Ferrari wins as the Ferrari crew physically try and drag you off the fence so they can nab your spot. By the end of 2017, I’d chalked up more than 1,000 hours photographing F1, was one of only 30 photographers to attend every race and made some life-long friends. I worked alongside the very best photographers in their field, many of whom had taken me under their wing, providing feedback on my shots and location suggestions. At 56 years of age, I was certainly the oldest 2017 rookie but what I year I had. This year I don’t intend to do every race but should manage to get to 15 or 16 events. You can see all my images and blogs at www.kymillman.com/f1. Testing times – what goes on before, during and after the mid-season shutdown?